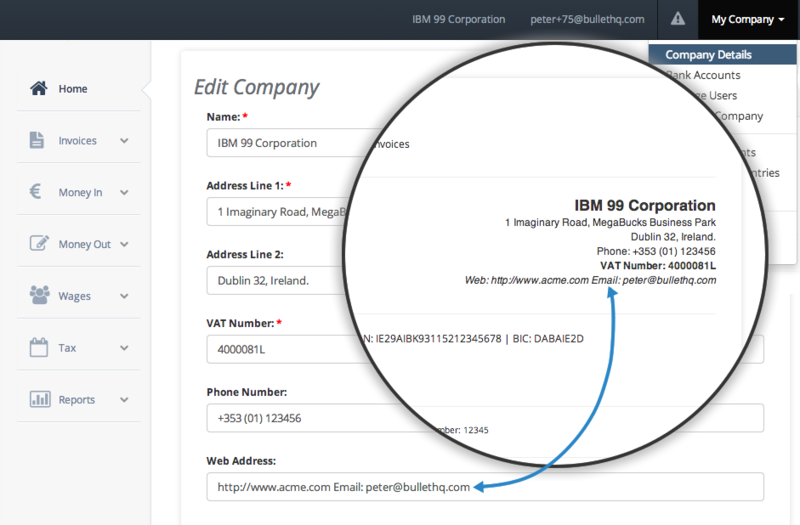 How Do I Personalise Invoices In Bullet Online Accounting Software? I can’t seem to add my email address. Thanks. I wanted to put an email address on the actual invoice so if it is printed out, the email address is on it. thanks. That’s pretty easy, just go to My Company > Company Details and click Edit. Then just add the text Email:name@email.com and it will appear on your invoices beside the email address. See the infographic below. 68Hi there, just wondering if the system is setup to allocate bad debt and move it from sales revenue figures?17Hi there! I seem to have made a bit of a mess of my bank accounts and was wondering what is the best way to go about sorting it all out?24Hey guys, I have a client that wants me to invoice him for the full amount of this project (he is getting a grant on his side and needs this as part of the criteria). However I have invoiced him twice already for 60% of the money (2 x 30%). Is there anyway I can merge these two invoices (plus the other 40%) into 1 invoice?28Hi guys. I, as an employee, pay into a Pension. My company does not contribute. However, I see the Pension liability listed in the company accounts. If it is being paid directly by the employee, why would it be on the company accounts? Thanks in advance, Darren102Hi. How do you add Vat onto an expense? Is there a setting to add this on ?